veggie num nums: Semolina "Gnocchi"
One of my food goals was to make Semolina Gnocchi. I've made potato gnocchi before, but I've been wanting to try the version made with semolina. I used the recipe from the cookbook Rome, at Home by Suzanne Dunaway. Before I shaped the gnocchi I tasted the dough and I knew right away that I wasn't going to be very crazy about these--too much of an eggy-dairy taste for me. So, I cooked the gnocchi in a cake pan and cut it into slices after it was baked. Though I wasn't very fond of this recipe, Dave really enjoyed it. 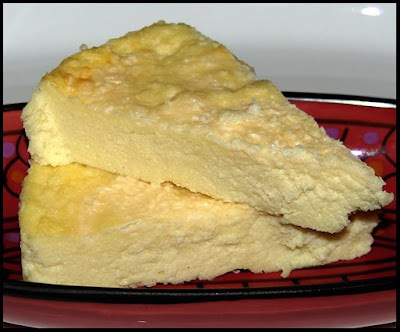 Heat the milk slowly to a boil in a heavy saucepan, add a spoonful of the butter, and with a whisk, begin stirring the semolina into the milk, taking care that lumps do not form. Cook for 15 to 20 minutes, until the mixture is very smooth and thick. Add the nutmeg and whisk in the eggs, the rest of the butter, and half of the cheese. Stir for a minute or two to blend. Turn the mixture out onto a smooth oiled surface, spreading it into a circle 1/2 inch thick. Let the mixture cool completely. Preheat the oven to 350F. Cut rounds of gnocchi and lay them overlapping in a buttered baking dish. Dot with butter and sprinkle with the rest of the cheese. Bake for 30 minutes or until lightly browned. Thank you for trying this recipe and for being so candidly honest about the outcome. It does save us busy bees a lot of time in our kitchen! It looks like semolina quiche! It's too bad that you didn't like this, but good thinking on your part to taste it first and then cook it in a different way.